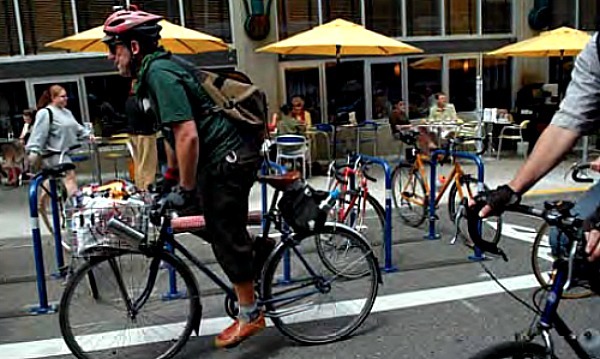 As summer comes to an end so must our series "Bike Plans in Other Cities." It's been fantastic taking this virtual tour around the world and learning about what other cities are doing to promote and sustain biking as a primary source of transportation. To end, we've rounded up our "Top 5" because, who doesn't love a good list? Hamburg (and many other German cities for that matter) are leaps and bounds -- er, revolutions and wheelies? -- ahead of many other cities in the world, and even within Europe (except for, of course, Copenhagen and Amsterdam where cyclists dominate the commuter landscape.) Hamburg also recently announced plans to become a car-free city in the next two decades. Year-round signage with detailed distances and approximate travel times will keep novice and experienced cyclists informed, from their bike plan, Calgary Cycling Strategy 2011. Calgary is definitely one of the best-newly-bike-planned cities in our series. Not only do they have an extensive Cycling Strategy, they also have three pillars (plan, design and build; operate and maintain, and; educate and promote) outlining just how they’re going to accomplish everything, the city has also recently committed to a minimum grid concept for their protected bike lane network. Calgary is also improving bike parking at transit hubs, implementing bike stations in employment-intensive areas, self-service repair facilities in strategic locations and having bike amenities for building tenants (like showers and change rooms). The mayor just proposed a minimum grid for bike lanes, following the installation of their first protected bike lane. (Toronto’s cyclist lobby group, Cycle Toronto, just launched a similar #minimumgrid campaign.) P.S. We love you Mayor Nenshi! A bike corral (group on-street parking) in downtown Portland. From their Bicycle Plan for 2030. Portland is pretty damn biketastic. The mayor is real bike lover too. So they seem to have bike planning down. Portland’s Bike Plan is heavily packed with numbers, which keeps things nice and succinct. Their Plan will add 103 km of bike trails, 505 km of separated on-road; including bike lanes, buffered (wider) bike lanes and cycle tracks (separated from motor vehicle traffic by a physical barrier), 412 km of bike boulevards (streets with minimized motorized traffic and bikes are prioritized) and 76 km of enhanced shared roadways. They’re also one of the only cities who have established various support groups that will appeal to all types of cyclists. These include: Women on Wheels, an annual training and encouragement program for women. Portland by Cycle, for novice cyclists. Bike Champions, a pilot project that offers incentives for downtown commuters who encourage their co-workers to try a bike. And, Biking is Back, a support and encouragement program for seniors. City of Amsterdam bike logo, from their bike plan, Meerjarenplan Fiets. One cannot think of Amsterdam without thinking of bikes, but that’s not the only reason they’ve made the list of great new-and-improved bike plans. With the €120 million to be invested by 2020, their priority is combating the shortage of bicycle parking (sound familiar? Ahem, Toronto?) By 2020 they will have 22,000 new spaces installed in their two main train stations, Central and Zuid stations. They’re also looking to combine existing bike lanes with new ones in the PLUSnet Fiet; a network of spacious, safe and fast routes through the city centre. The path will be tailored to the number of cyclists using them, cyclists will have priority at intersections and countdown timers will reduce anxiety in waiting cyclists. It’s hard to tell if their slogan, “We’re not cyclists, we’re just Dutch” is too modest or too arrogant, either way we applaud them. 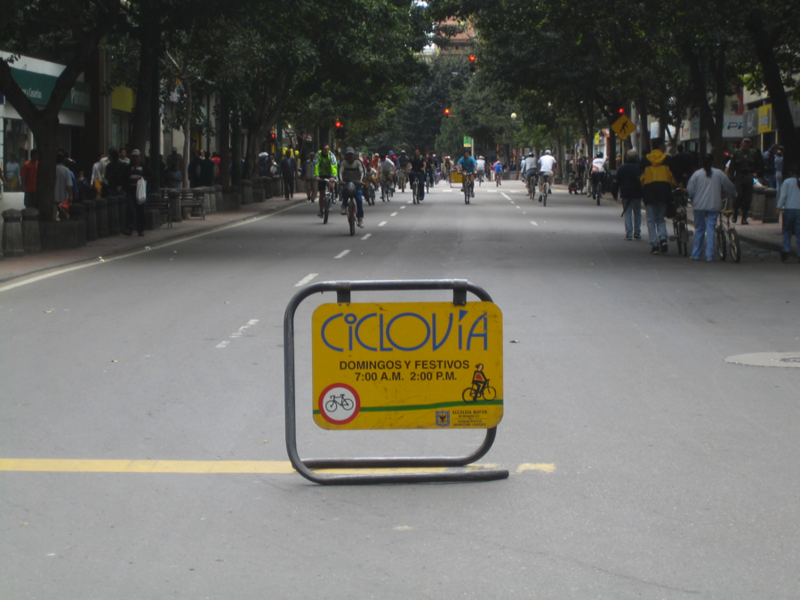 A Flickr photo of Ciclovia in downtown Bogota courtesy of Micah MacAllen. Bogotá is the birthplace of Open Streets -- recently piloted in Toronto with great success -- and it's also really, just the cutest city. With all of these big metropolises boasting their multi-thousand-kms of brand spankin’ new bike lanes, Bogota is the underdog. And who doesn’t love an underdog? 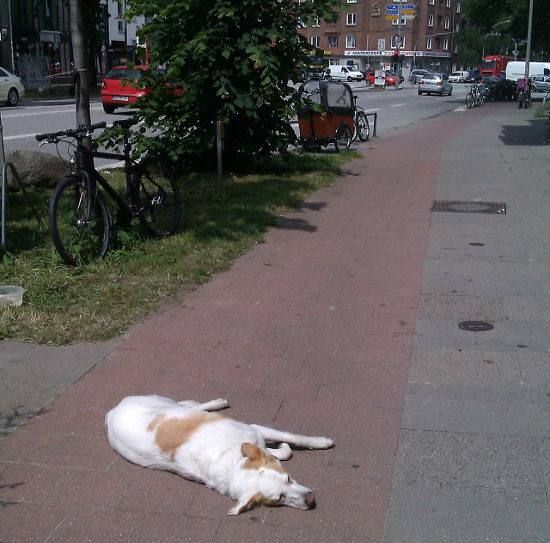 (...unless s/he's blocking the bike lane - see Hamburg, above.) While these larger cities are able to collect the necessary funds to install state-of-the-art cycling infrastructure, some Bogotá residents struggle to provide basic needs for their families. But this didn’t stop the city from implementing 300 km of new bike lanes to accommodate the 400,000 daily cyclists. While the aim of biking in most big cities is to improve people's commutes, in Bogotá it's also to bring communities and individuals together. Hence, Ciclovia, which is their version of Open Streets. Their cycling networks look to connect education centres with heavily populated residential areas. As well, connecting residential areas with parks, attractions and businesses. You go Bogotá! The City of Toronto is currently re-vamping it's official Bike Plan, which will then be approved by the new council in 2015. We hope it includes a #minimumgrid of protected and connected bike lanes and boulevards in downtown but also in the suburbs of Toronto. 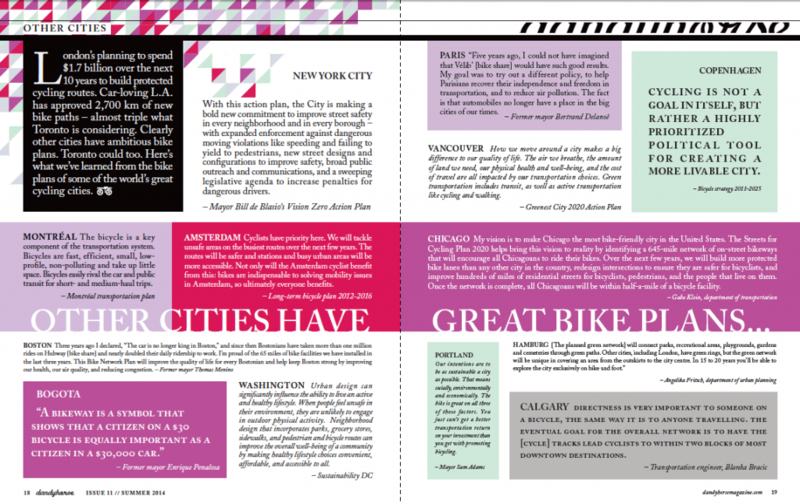 Alex Chronopoulos has been dandyhorse's diligent web editor over the spring and summer of 2014 and this is the conclusion to her series "Bike Plans in Other Cities" -- thank you Alex and good luck as you return to journalism school this year! Alex will continue as a contributing writer and editor on the dandyBLOG.